Delivered by Nicholas Birns, Berg Collection, New York Public Library, October 26, 2011. I first heard of Samuel Menashe in the mid-1980s through reading British poetry periodicals such as PN Review and Agenda. I was struck by the way articles in these periodicals referred to a living American poet I had not heard of as if he were already part of the firmament, already integrated into the fabric of universally assumed references. When the University of Maine Press released his Collected Poems in 1986, I bought them and became familiar with his work. As a consequence of this, in 1991, when I was asked to write for an anthology on poems more or less of my own choosing, I chose Samuel's poem "Curriculum Vitae"
And no time to spare. I knew that this poem referred to Menashe's fifth-floor walkup, where, the British poet and critic Donald Davie had put it, he lived "alone and frugally." Little did I know that, in the course of cleaning out Menashe's papers, I myself would mount those five flights of stairs hundreds and hundreds of times. I later published two more essays on Samuel's work (four in total, but two more before I met him). Yet, as Samuel constantly reminded me, I made no attempt to contact him. Just as Samuel, when young in Paris after the Second World War, never even thought he would meet a poet, yet alone become one, at that point I did not see that any poet I wrote on would want to be contacted by me. We were finally introduced in 2002 through the agency of a senior American author (you can work out who she is from the context, since I have provided the gender) who suggested to Irving Malin, a retired literary critic who had taught at CUNY, that a new article be written on Menashe's work, that he was still underrated even though his recent omnibus volume The Niche Narrows had received very positive notice. I met Samuel in December 2002 and wrote a long piece about him for The Hollins Critic. On the internet, there is a recording of Samuel reading this poem. It feels eerie to hear his voice, so strong and confident. This would have been in 2006 or so, before he became ill and frail. I am still used to the ill, frail Samuel, but tend to forget that until 2009 or so he was still at the height of his vigor, not, as goes the Dylan Thomas line alluded to in that poem, going gently at all into that good night. But my friendship with Samuel was not one-sided or confined to his own poetry. We talked about poetry, the Bible, literature in general, politics. He was often a crucial backchannel reasder or editor of my own work, at first the subsequent essays I wrote on his poetry, then, as I became increasingly aware of his intellectual breadth—Samuel loved the word 'breadth'—and learning, on virtually every aspect of my work. As I will come back to later, the man was not just a great poet but also an intellectual. I was very privileged to know Samuel in the years he finally got his due recognition; the Neglected Master award from the Poetry Foundation in 2004; regular publication in the premier literary magazines of our day; increasing awe and respect from younger writers such as the award-winning novelist Colum McCann, who inscribed a short story of his to Samuel with these words: "We have taken our voice from yours." As much as Samuel was wont to rue his earlier lack of recognition, he understood what a gift and a miracle his being loved and respected in his own lifetime was; after all, none of his great idols among the poets of the past two centuries—William Blake, Emily Dickinson, Gerard Manley Hopkins—had received anything like this. I think that God, or whatever agency you prefer to impute these things to, placed me in Samuel’s life when he needed me; both when his career was finally becoming as spectacular as it should always have been, and when he needed logistical help of the sort I, being relatively young and geographically proximate was able to provide. It was wonderful for me to be able to give help and care in a way that I think mattered. Samuel was a world of paradox. Concentrated intensely on his own career and inner life in the way any truly creative person needs to be, he was nonetheless incredibly concerned about the lives of others, always asking after the health of my parents, scrupulously sympathetic to what was going on with the people he knew. He also brought people in touch with each other: to know Samuel was also to know John Thornton, his fellow soldier and lifelong, cherished friend, and also Frank Ceglia, Margaret Mills, Neil McDonnell, and the many others who are here as well as those who wished they could be here. Among the latter, Herb Weisberg, whose selfless management of Samuel’s last years was truly heroic, must stand paramount. Though he never married or had children, was a lifelong, solitary bachelor, Samuel was really a family man, and made all his friends and relatives feel they were part of an invisible, extended family. —and later the Washington Square Diner, where Drucilla Cornell and I shared many a meal with him. Samuel was irrepressible. During one diner meal, he noticed that the man at the next booth was listening to us talk about poetry. He tapped the man on the shoulder and gave him a flyer for the new Library of America book. “Do you always promote your work to total strangers in Greek diners?” asked the man. “YES,” roared Samuel. Yet Samuel was not a local color figure. Indeed, he had the same sort of easy relationship to many cities where had spent significant time. These included Paris, where he studied after the war, where he made some of his closest friendships, and where he cultivated a true love of the French language, especially the poetry of Baudelaire. In his last months at the Esplanade, he acquired a copy of Andrei Makine’s Le testament français, and read it slowly and deeply. “This will be the French book for the rest of my life” he said. At the Sorbonne, he had studied under the theorists Jean Wahl and Étienne Souriau, and wrote his doctoral thesis, several copies of which are possessed by the Berg. The thesis, which Samuel termed an ´étude introspective,’ sheds crucial light on issues ranging from the role of the Jews in the history of Europe to the sources of his own poetic awareness. A French obituary for Samuel put it perfectly: Il était connu pour ses poèmes brefs et puissants. 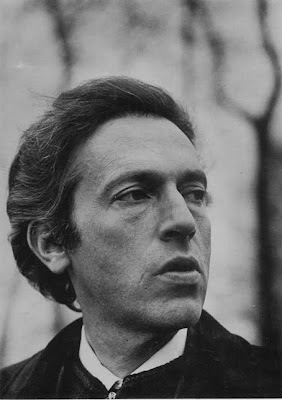 Samuel also loved London, where he went in 1960 to finally secure publication of his first book of poetry. This was the turning point in Samuel’s life, the time when his dreams became possible, due both to the generous backing of Kathleen Raine and his own indomitable persistence. “I had to wrestle for that blessing,” he said. Britain gave Samuel his reputation, enabled his work to be heard, and also offered another arena for Samuel’s incredibly wide social coverage, including aristocrats, poets, newspaper editors, and statesmen. I wish I had been able to see Samuel in London: capering around, enthralling audiences large and small, above all intoning his poetry, as he did most recently at the Ledbury Festival in 2008. He was proud that, to many British readers, it was not necessarily evident in his work that he was an American. One of Samuel’s last readings was, appropriately enough, on St Patrick’s Day. As his cousin Herb recently told me, Samuel also lived in Los Angeles for three years, trying to make it in the movie business, where even his good looks, talent, and charisma could not avail him. Another place important to him was Ibiza, where he honed his incredibly good Spanish—which he employed to translate Antonio Machado and to heckle Latino waiters in the aforementioned Greek diners—and, in 1955, wrote his sole and incredibly intense short story on his wartime battle experience. He also went to Morocco. Samuel wrote a poem set in Tangier, beginning, “As the tall, turbaned black incense man…” He cared about many other places: Congleton, in Cheshire, England, where he had been stationed after crossing the Atlantic, Dieblich on the Rhine, where Samuel, as young American soldier, was welcomed by a gemütlich German woman, who upon learning Samuel was Jewish, said “I knew God would curse us for how we treated the Jews.” These scenes from over sixty years before were recalled effortlessly, expansively, in a tone of someone who knew he was a witness to history. Until his miraculous late years, Samuel was underappreciated in the literary world. Being a forthright man, he made his resentments known. One time at the New School, Paul Muldoon was reading as part of the Best American Poetry annual event; Muldoon had chosen the poems for that year. Samuel went up to Muldoon at the end, saying “You edited the Best American Poetry this year! I had four poems in Poetry magazine, and you did not choose any of them!” Muldoon, staggered, could only mumble, in his decent, honorable way, “oh dear.” Samuel’s record of encounters, encouragements, rejections went back decades; he was taunted by T.S. Eliot’s friend, John Hayward, warmly cheered by an elderly Marianne Moore, whose groceries he helped carry across Sixth Avenue. I had a private joke that Samuel had thought himself a contestant for the Roman Forum prize in 110 AD, only to lose to Juvenal. In that case, he would have been justified to claim anti-Semitism as the reason. Yet, I came to understand, much of this complaining was for show, and, more complexly, much of the way Samuel lived, eschewing every conventionality, exulting, complaining, celebrating, raging, was itself part of a long poem, as boundless as his actual poems were concise: a poem of his life, a strand, a thread, uniquely his. As great as his enmities in the literary world were—he boasted to a prestigious Washington, DC audience assembled by his friend, and crucial backer, Dana Gioia, that he had a “hit list”—he seized upon reconciliation when it occurred. One of the last readings he attended was an evening of jazz and poetry led by Robert Pinsky, against whom Samuel formerly had some sort of grudge. Samuel went up to Pinsky after the reading to congratulate him and Pinsky, truly moved, embraced Samuel. During his final months of hospitalization and stays at the Hebrew Home and the Esplanade, Samuel returned to that moment of reconciliation, almost Biblical in its color and amplitude, again and again. In the future, accounts of Samuel’s era will reconcile his work and its worth to the history of poetry. And also in his lone short story, “Today is December 11th and We Are All Going to Die,” recounting his experiences in the Battle of the Bulge. This is a very intense story, which Samuel showed to few people, although he let it be republished in Irish Pages and read it aloud in one of his last public appearances. I indeed have heard the story twice, once when Samuel read it on that occasion, once when I read it to Samuel, the last time I saw him, three days before his death. It was so intense, so unremitting, laying the heart so bare, that the only text I could think of to equal these qualities was the last act of King Lear, Which I proceeded to read aloud to Samuel. As a very young man, Samuel had been in as intense conditions as it is possible for a human being to dwell in and still live. The poem reaffirms the identity of matter and spirit that Samuel saw as one of the core values of Judaism. But Samuel's Jewish identity was also expressed in yearning, as in “Premised Land”. The late editor of Midstream, Joel Carmichael, said, “Putting in a jew's harp at the end does not make it a Jewish poem.” Never one not to have the last word in a conversation, Samuel said “Oh yes it does.” And he got his way: the poem was published. Returning to Samuel’s mother, Brantzia Barak, she was a great inspiration to Samuel, and the subject of some of his most fervent poetry of love and loss. With me you die twice. Samuel’s father had advised him that, due to a financial reversal, Samuel could not count on the full scope of the inheritance he expected; he would have to ‘trim his sails.” Samuel said loftily, “My estate is not one of money, I am a poet, art is my realm.” Samuel’s father, simply and straightforwardly said, “I am glad of that.” Though he very much charted his own course, Samuel in life and art was, in reality, never one to trim his sails. We are privileged that, in such a long and valorous life, he sailed so abundantly among us. Nicholas Birns is Associate Teaching Professor at Eugene Lang College, the New School, New York. He is the author of Understanding Anthony Powell (University of South Carolina Press, 2004) and Theory After Theory: An Intellectual History of Literary Theory From 1950 to the Early 21st Century (Broadview 2010) and the co-editor of A Companion to Australian Literature Since 1900 (Camden House, 2007), which was named a CHOICE Outstanding Academic Book of the year for 2008 and of Vargas Llosa and Latin American Politics (Palgrave. 2010). 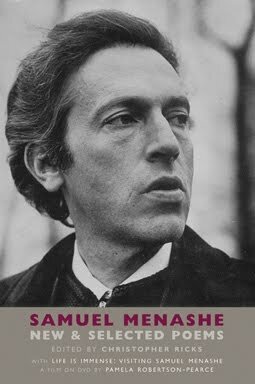 Samuel Menashe's New and Selected Poems, edited by Christopher Ricks, was published by the Library of America in 2005. An expanded edition, published with Life Is Immense: Visiting Samuel Menashe, a film on DVD by Pamela Robertson-Pearce, was published by Bloodaxe Books in 2009.